By the mid-1930s most nations with an interest in such things, were trying to understand how nuclear energy worked. Physicists in Germany, Denmark, Hungary, Japan, England, and the United States were writing and reading scientific papers on the subject, learning from one another. As you can imagine, this is a very complex subject. Some were doing better than others, and some were just starting to understand the basics. No one had considered using this new source of power as a weapon. That was about to change. You need a few things to make a reactor that develops enough heat to operate a power plant, Then, those things must be pushed to their limits to create an explosive device. None of this was possible at the time, especially for nations like Japan that had only meager natural resources. What is needed for nuclear power is a very refined form of uranium, something Japan lacked. They did not have enough uranium to experiment with, much less make fuel rods for a reactor or the core of a nuclear weapon. Additionally, the equipment needed to refine the uranium was non-existent at the time. There are four ways to enrich uranium ore to the purity needed for either application. Starting with uranium ore, it is mixed with a form of fluorine, forming uranium hexafluoride. This gas is then placed in either a centrifuge or an electromagnetic field, or passed through extremely fine filters or fed into a thermal separator. All four processes consume huge amounts of electricity, so these plants are located near large power sources. Japan did not have equipment to build a centrifuge or an electromagnetic field powerfull enough, nor did they have the technology to make atomic-sized filters. The remaining method was rather simple and inexpensive, so they began making a thermal difusion plant. This method requires concentric tubes that are spaced closely within one another. Alternating tubes are heated and cooled and the gas is fed in. The sepearted product is drawn from one end of the cold tube and the residue is drawn from the hot tube. A series of these tube clusters are connected so one feeds the next, increasing the purity of the product. But the Japanese had only a small amount of uranium. They sent researches across their empire trying to find a source of ore, with little luck. Eventually, they found a uranium mine with a fair amount of ore near Hungnam, Korea, which at that time was under Japanese control. Eventually, the war came to an end before sufficient uranium ore was sent to Japan, ending the program. Time passes. Five years after Japan surrendered to allied forces, war broke out in Korea. Allied forces had pushed the North Korean army almost to the border with China. 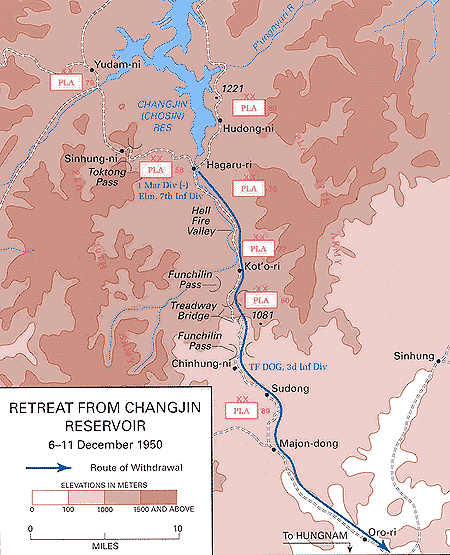 Then, on 27 November 1950, the North Koreans reversed the allied advances by attacking the allied forces at the Chosin Reservoir. It was a very difficult battle that led to a massive withdrawl of allied forces to the south. It was a very narrow escape from almost certain disaster. Eventually, allied forces advanced north and recovered all of what is now South Korea, bringing the war to a stalemate, eventually being settled as it is today, with a cease fire between the north and the south. The question then is why were the North Koreans pushing south so hard at the Chosin Reservoir? The answer is that the hydro-electric power plant at the reservoir. It is the power plant that provides power to North Korea’s nuclear program that had taken over the abandoned Japanese uranium factory at Hungnam. Once Japan abandoned the factory, the North Koreans, along with the Chinese who helped them in the battle, restarted production of uranium. This was North Korea’s entry into the nuclear power that today is threatning South Korea, Japan and the rest of the world. This entry was posted in American History, Communism, History, Imperialism, Japan, North Korea, Science, South Korea, United States, World War II and tagged korea, Nuclear Energy, World War II. Bookmark the permalink. Thanks Terry. As usual, you brought a bit of historical, technical knowledge I had not known about. Thanks. One more mash-up from several sources.